This was just something I had trouble getting used to at Taqueria Cancun. Check out that rice. 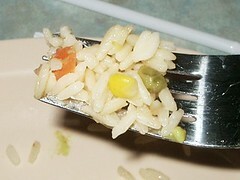 Itty bitty diced carrots, pleas, and corn remind me of frozen cafeteria food. I suppose that's an unfair thing to say. I'm just not used to it. I had a steak burrito, which was really good. It came with jalapeños without my asking, so bonus points there. I just couldn't help but notice the peas in my tortilla mattress. That makes me the princess. This Taqueria Cancun meal was rated: 6.8. Friday, June 03, 2005 by Jonah.